German close-support attack aircrafts and fighter-bombers Focke-Wulf Fw 190 F, G.
From 1943 the Focke-Wulf Fw 190 replaced the Ju 87 in most ground attack units. This example, an F-8 of Schlachtgeschwader 10, was operating in Hungary during the winter of 1944-45. The bomb container under the fuselage housed SD-2 or SD-10 cluster bombs. Focke-Wulf Fw 190 F and G-series. Type: German Luftwaffe close support attack aircraft and fighter-bomber. Fw 190 G of Schlachtgeschwader 2 ‘Immelmann’ in mid-1943. It had been the first unit to equip with the new ground-attack version in North Africa but moved to the Eastern Front. The Focke-Wulf Fw 190 F as well as G (the E reconnaissance fighter and high altitude H models not being produced) had been short-nosed versions, developed from the Fw 190 A. The Fw 190 F series’ main type, the F-8, had arrangement for underwing rocket projectiles. The two F and G models had been BMW801-powered, the second becoming mainly fighter-bombers in which gun armament was cut down allowing (on the G-1) a single 3,968 lb bomb, or on any other G models up to 2,205 lb of small-sized bombs, to be taken. The Focke-Wulf G and F were replacement of the Ju 87 Stukas within the ground-support squadrons at the end of WW2. The F models were close-support attack planes, a few receiving the Panzerblitz assortment of R4M rockets for tank-busting. There have been more than Forty additional specific armaments, and a few of the final models had armoured leading edges for ramming B-17 Fortress or B-24 Liberator bombers. Overall Focke-Wulf 190 manufacturing, which ended in 1945, was around 19,500. The Focke-Wulf 190 was the first fighter to provide the Luftwaffe a combat edge over the earlier Supermarine Spitfire fighters. Its general adaptability, too sophisticated to list here, had been classified by a number of equipments to evolve serial planes to various tasks, and the allocation of some Eighty trial numbers to individual development planes. Users: Germany, Croatia, Slovakia, Hungary (for Fw 190 F and G). Focke-Wulf Fw 190 F-8 with MG 131 machine-guns in a bulged cowling, under-fuselage rack for a 250kg bomb, and underwing racks for four 50kg bombs. A pair of Focke-Wulf Fw 190 G-3 extended-range fighter-bombers flying over Romania, possibly in service with II/SG10, in early 1944. 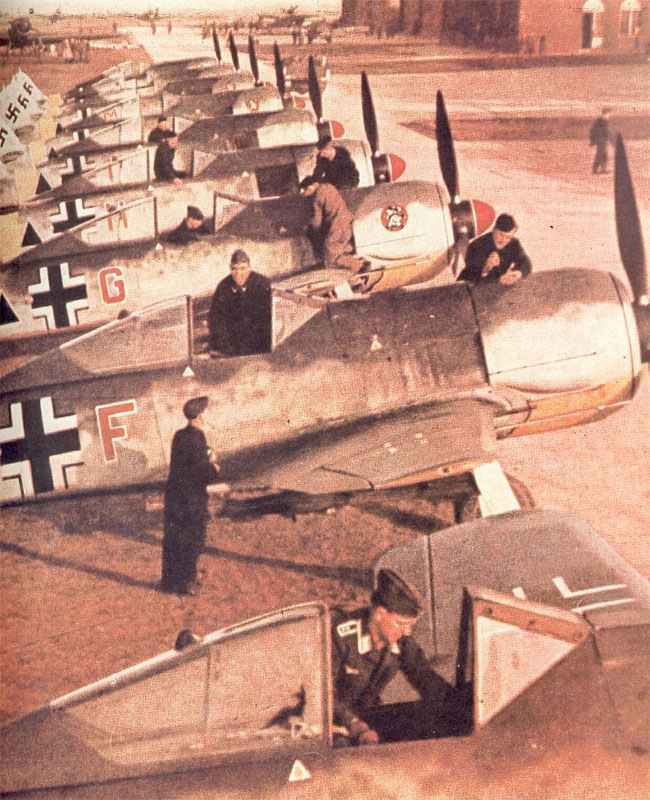 By this time the Fw 190 was the most important Luftwaffe multi-role tactical aircraft on all fronts. 3D model Focke-Wulf Fw 190 F-8. Tagged 1944, fighter-bomber, focke-wulf, fw 190, germany, luftwaffe.